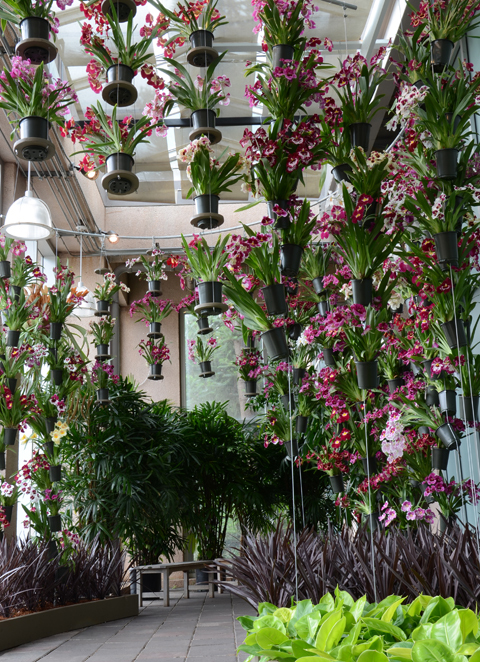 Orchid Daze 2012, Hanging Gardens was designed by Tres Fromme of StudioOutside. Tres' design for the entrance makes brilliant use of the soaring space inside the Conservatory Lobby. The orchid tapestry measures 12' from floor to ceiling. As seen from above its curving outline is broadly S-shaped as it traces a path between two opposing beds. The tapestry forms a vertical arch above the pathway in several places, allowing visitors to walk beneath it. 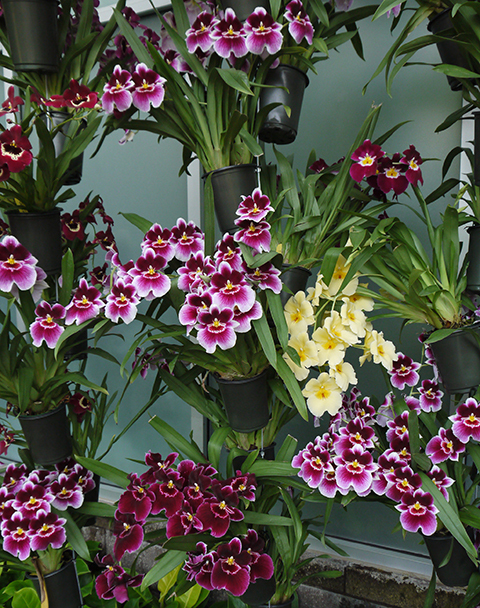 The Pansy Orchid (Miltoniopsis) is a terrific subject for this display. Miltoniopsis flowers are as large as those of Phalaenopsis and nearly as long lasting. The arching spikes are shorter than those of Phalaenopsis, but the plant typically produces 5 or more spikes of beautifully presented flowers. 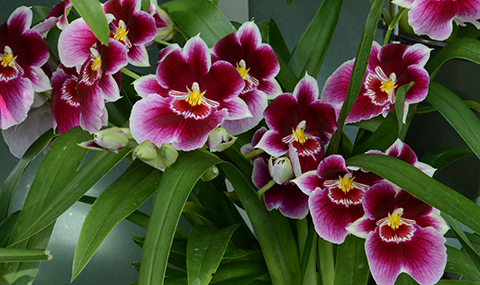 Miltoniopsis is much more tolerant of cool temperatures than Phalaenopsis, and so pairs well with Cymbidium, Dendrobium nobile, Masdevallia and other cool growing orchids that wither in the company of warm-growing Phals. And they smell delicious. In fact the fragrance in the Conservatory Lobby is overwhelming--in a sweetly floral way. Oncidium Twinkle (we used two color forms: 'Red Fantasy' & 'Yellow Fantasy') makes a perfect pairing with Miltoniopsis hybrids, in texture, color and fragrance. The delicate texture of the flowers looks wonderful alongside the bolder flowers of the Pansy Orchid. 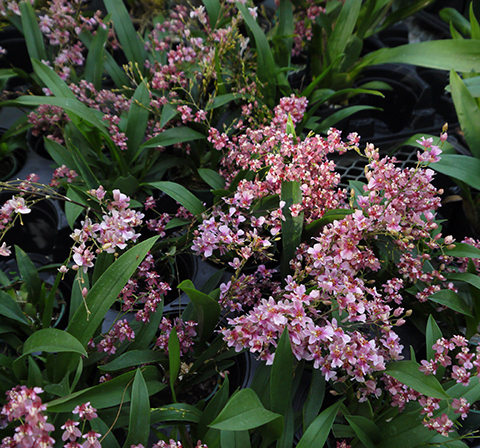 I have always wanted to use Oncidium Twinkle in a display and finally had an opportunity this year. 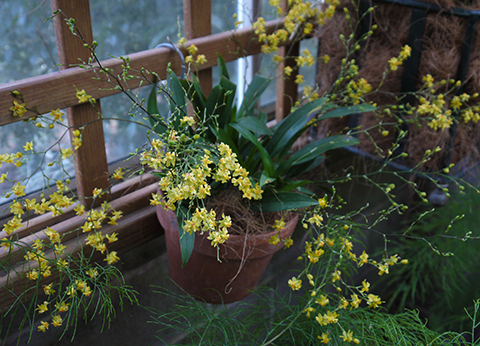 Orchid Daze 2012, Hanging Gardens runs through Sunday April 15.